C.S. Osborne Black Plain Rim Grommets And Washers. Brass material with dull black finish grommets and washers. You will receive 144 grommets and 144 washers. Made in USA. Size : 0 Diameter of hole : 1/4" 144 washer and grommets per gross Set these grommets with one of the following tools: C.S. Osborne Plain Washer Grommet Setter, C.S. Osborne Grommet Kits or Press-N-Snap Tool. Punch holes before setting grommets with one of the following tools: C.S. Osborne Drive Hole Punch, C.S. Osborne Revolving Hole Punch or Screw Hole Punch. C.S. Osborne Black Plain Rim Grommets And Washers. Brass material with dull black finish grommets and washers. 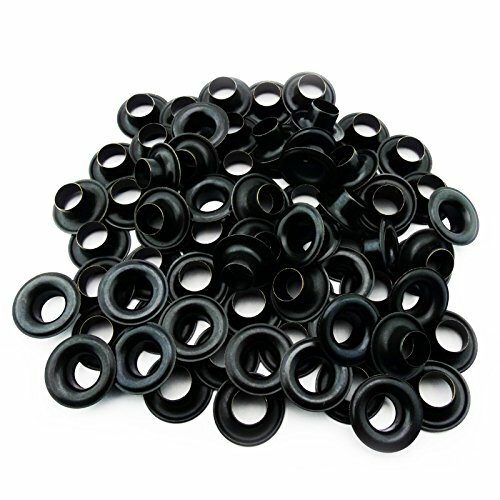 You will receive 144 grommets and 144 washers. Made in USA. Diameter of hole : 1/4"
Manufacturer: C.S. Osborne & Co. Publisher: C.S. Osborne & Co. Studio: C.S. Osborne & Co. If you have any questions about this product by C.S. Osborne, contact us by completing and submitting the form below. If you are looking for a specif part number, please include it with your message.